Kids get a lot of vaccinations when they are little, but many parents and other adults forget that they may need immunizations too. Just because you are an adult doesn’t mean you aren’t at risk for certain diseases. In some cases, depending on age and other factors, adults may be more at risk for these diseases than children. So make sure you check with your healthcare provider and keep up to date on your immunizations no matter what your age. It just might save your life. Tetanus (Td or Tdap): After the initial series of tetanus shots as a child (included in the Dtap), all adults need a booster every 10 years. It is recommended that one of those be replaced with a Tdap to protect against whooping cough (pertussis) at some point between the ages of 19 and 64. Pneumonia: All persons over the age of 65 should have a pneumonia vaccine one time. If you have risk factors putting you at higher risk for the disease, you may need these vaccinations before you turn 65. People with chronic illnesses and suppressed immune systems will need this vaccine every 5 years. Influenza: The current recommendations for flu shots are that all children under 18 and all adults over the age of 50 receive the vaccination yearly. It is also recommended as a yearly vaccination for anyone between the ages of 19 and 49 who meets at-risk criteria. MMR: If you have not had an MMR vaccine and have never had measles, mumps or rubella (german measles), you may need the vaccine. One or two doses are recommended if you are between the ages of 19 and 49 and one dose is recommended for those over the age of 50 who are at high risk for these diseases. HPV: The HPV vaccine is a relatively new vaccine to prevent certain types of cervical cancer. It is recommended for girls between the ages of 11 and 24 and needs to be given in three doses. 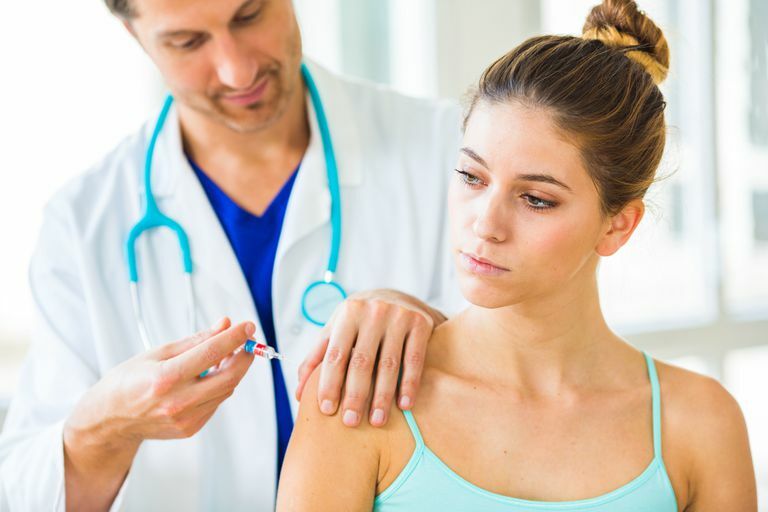 Varicella (Chickenpox): The varicella vaccine is recommended for all adults who have never had the vaccine and have never had the chickenpox disease. This vaccine is given in two separate doses. Hepatitis A: The hepatitis A vaccine is recommended for all adults who are at high risk for the disease. It is given in two doses. Hepatitis B: The hepatitis B vaccine is recommended for all adults who meet high-risk criteria for the disease. It is given in three doses. Meningococcal: The meningococcal vaccine is recommended for all adults who are at high risk. It protects against certain types of meningitis and pneumonia. One or more doses may be necessary depending on your risk factors and your doctor’s recommendations. Zoster (Shingles): One dose of herpes zoster vaccine is recommended for all adults over the age of 60. It protects against shingles, regardless of whether the person has had the disease before or not. These recommendations apply to healthy, non-pregnant adults. If you are pregnant or have a chronic illness with severe immunosuppression (such as HIV or you are undergoing chemotherapy or radiation) the recommendations for vaccination may vary significantly. You should always speak with your healthcare provider before being vaccinated to determine what vaccines you need and when you should get them. ”2012 Adult Immunization Schedule.” Vaccines and Immunizations 16 Feb 12. Centers for Disease Control and Prevention.